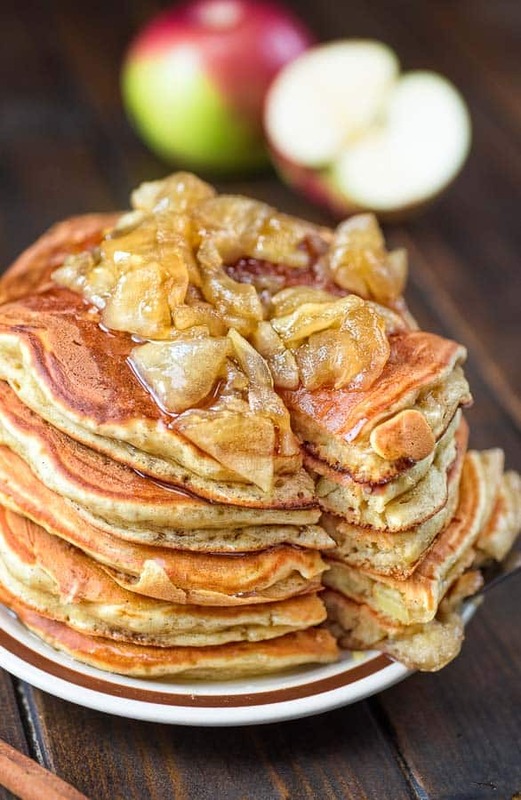 Very thick and fluffy, made with eggs, yogurt, fresh apples, organic cane sugar, and cinnamon – these Apple Pancakes have been in my family for generations! This post has been sponsored by Wholesome. All thoughts and opinions are my own. I cannot think of a better breakfast to enjoy on a crisp, fall/winter morning. Soft, fluffy, filled with tender apples, and topped with warm apple jam, these pancakes are filling my heart with coziness and my stomach with joy. 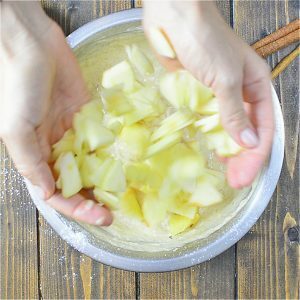 Don’t hesitate for another minute, and give Mom’s Apple Pancakes a try! Find this treat in the baking section of your local grocery store, and give it a try. 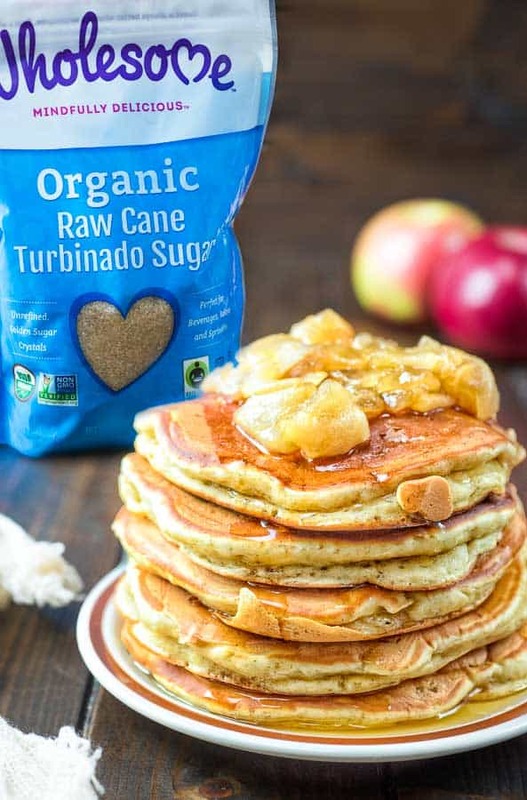 You can also check out Wholesome website to learn more about the Organic Turbinado Raw Cane Sugar used in this recipe, and if you’re unable to track it down at a store near you then you can purchase this Organic Turbinado Raw Cane Sugar online. Try getting some sweet, soft apples for the best results. 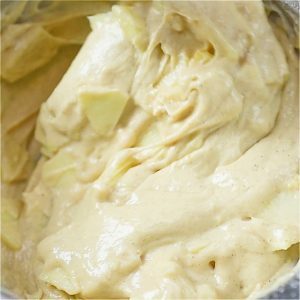 They soften even more while cooking and create a very nice texture. Once you’ve got some fresh apples and great sugar, let’s start cooking! 1. 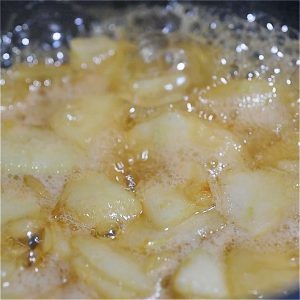 To prepare the topping, place the apple pieces and cane sugar in a small saucepan. Bring to a boil and cook on low heat for about 5-7 minutes. Set aside. 2. 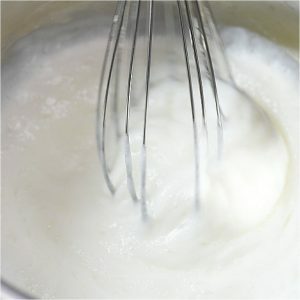 Whisk together the yogurt and baking soda. 3. Sift the flour into a large mixing bowl. Add the sugar, cinnamon, egg, and yogurt mixture. 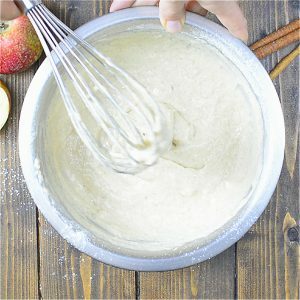 Mix until a smooth batter forms. 4. Gently fold in the apple pieces. 5. 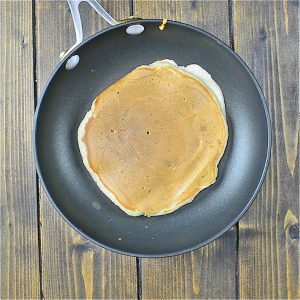 Using a 1/2 cup as a measure, scoop the pancake batter onto the pan, then gently spread it into a flat circle, about 1/2 inch thick. Fry on medium-low heat for about 2-3 minutes, or until bubbles appear. Flip the pancake and cook for another 1-2 minutes, until golden brown. 6. As the pancakes are ready, garnish them with the apple topping and a little honey. Serve hot. And now, these wholesome, tasty, and oh-so addictive pancakes are ready to be enjoyed! Grab a cup of your favorite coffee and a big fork, and start your morning off right! Can’t get enough of Wholesome? Check here for even more recipes using Wholesome Sugars for this holiday season and here for inspiration using all of the great products Wholesome has to offer! Check out these coupons that help you save on your next purchase. 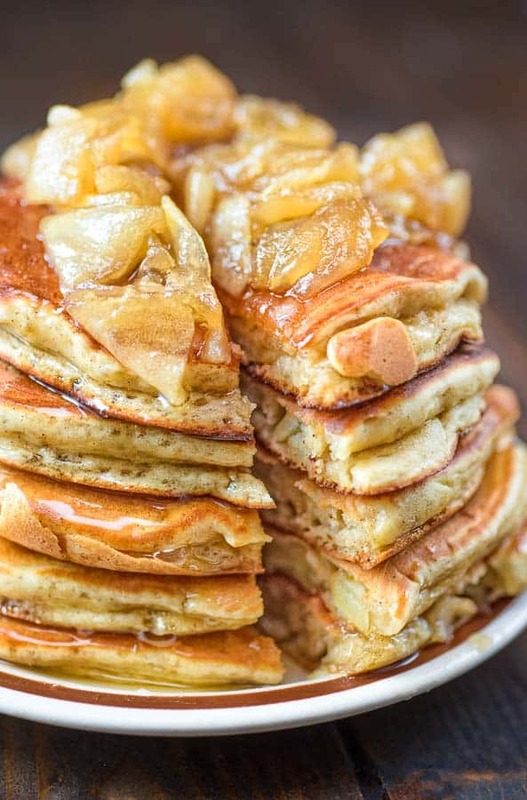 Very thick and fluffy, made with eggs, yogurt, fresh apples, organic cane sugar, and cinnamon - these Apple Pancakes have been in my family for generations! 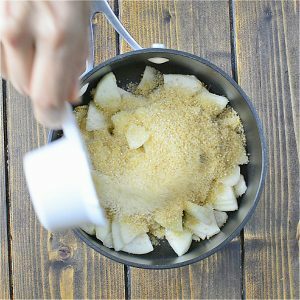 To prepare the topping, place the apple pieces and cane sugar in a small saucepan. Bring to a boil and cook on low heat for about 5-7 minutes. Set aside. 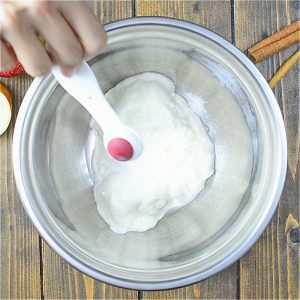 Whisk together the yogurt and baking soda. 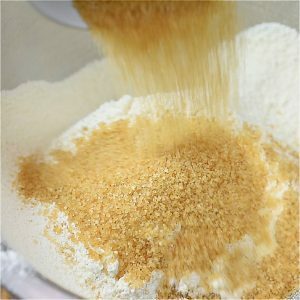 Sift the flour into a large mixing bowl. Add the sugar, cinnamon, egg, and yogurt mixture. Mix until a smooth batter forms. Gently fold in the apple pieces. 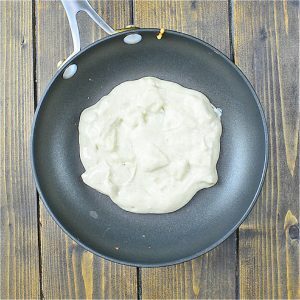 Using a 1/2 cup as a measure, scoop the pancake batter onto the pan, then gently spread it into a flat circle, about 1/2 inch thick. Fry on medium-low heat for about 2-3 minutes, or until bubbles appear. Flip the pancake and cook for another 1-2 minutes, until golden brown. As the pancakes are ready, garnish them with the apple topping and a little honey. Serve hot. 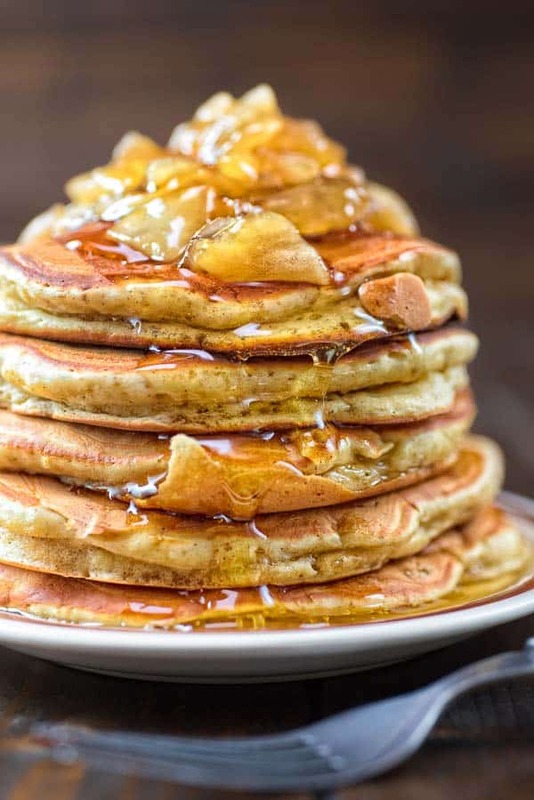 Pancakes are excellent, made with out apple topping,and used real maple syrup. Yum thank you for sharing! Thank you so much, Julie! Nothing better than real maple syrup on pancakes. 🙂 Glad you enjoyed them! Thank you so much, Michelle! Cannot wait for you to try these! Those pancakes look amazing! And I love Wholesome sugar. It’s my fav! It’s my favorite too, Kristen! Thanks! Oh, these look so delicious, Tania! I love pancakes and we try to make them on Sundays when we have a little time to laze around. I will definitely try this. Fabulous!